Take a bowl of water and add ginger and wash well rubbing between fingers. Wipe the washed ginger with a dry cloth. Cut the ginger into small pieces. Peel onion and cut it into small pieces. Take tamarind into a microwave safe bowl and add 50ml water. If time permits allow tamarind to soak till it softens. If time does not permit place this tamarind bowl in microwave oven and cook on high power for 40 seconds or till water starts to boil. Cool the cooked tamarind. Place a tea strainer in a bowl and keep it nearby as we need to transfer the fried seasoning into it. Heat a pan and add 1Tbsp oil and heat it. When oil is hot add onion pieces and fry on medium heat stirring continuously. When onions turn translucent and soft switch off the flame and transfer them into a plate to cool. In the same pan add 3Tbsps oil and heat it. When oil is hot add fenugreek seeds followed by black gram. Fry the ingredients stirring on low flame till they start changing color. Then add mustard seeds and fry stirring till mustard seeds splutter. Then switch off flame and add asafetida and red chili pieces and mix well. As the pan and oil is sufficiently hot, even we switch off the flame that heat would be sufficient for the red chili pieces to get fried crisply without getting burnt. Transfer the fried seasoning into the tea strainer in the bowl so that oil gets separated from the fried ingredients. Take a mixie jar and add fried seasoning, ginger pieces, grated jiggery, salt, fried onions and softened tamarind (without water). Cover the mixie jar with a lid and grind the ingredients. After a while, remove lid and mix with a spoon and add tamarind water and grind to a smooth texture. If required add additional water little by little and grind to get a smooth textured chutney. When the chutney is ground to the required consistency add the oil separated from the fried seasoning. Using a PULSE button run the mixer grinder to incorporate the oil in the chutney. Now transfer the prepared chutney into a bowl. While making dosa spread this chutney on the dosa evenly while frying it and place some potato curry in the centre of dosa and fold it and serve as Mysore Masala Dosa. As onions, ginger, tamarind and red chilies are always available in any kitchen, it is easy and quick to make this chutney as and when required. 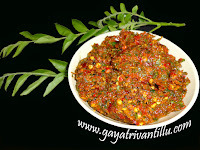 Use this chutney as an accompaniment with Idli, Dosa, Utappam, Pesarattu, Ravva Dosa etc or with Curd Rice. While frying onion pieces, fry till they turn translucent---and from this stage fry for few more minutes and they turn soft. Do not fry the onion pieces till they change color---we just need to remove the raw smell of onions by frying them to the required stage. Onions give a sweet smell to the chutney. All the spices added are to taste so adjust according to your taste. Adjust the amount of jiggery also depending upon the sweetness of fried onions. One should be able to feel the flavor of salt, chilies, sweet and sour tastes equally when we taste the chutney—so adjust spices accordingly. 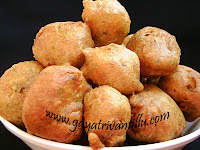 Serve with tiffins or with curd rice.